Beautiful home in popular Pelham Falls! 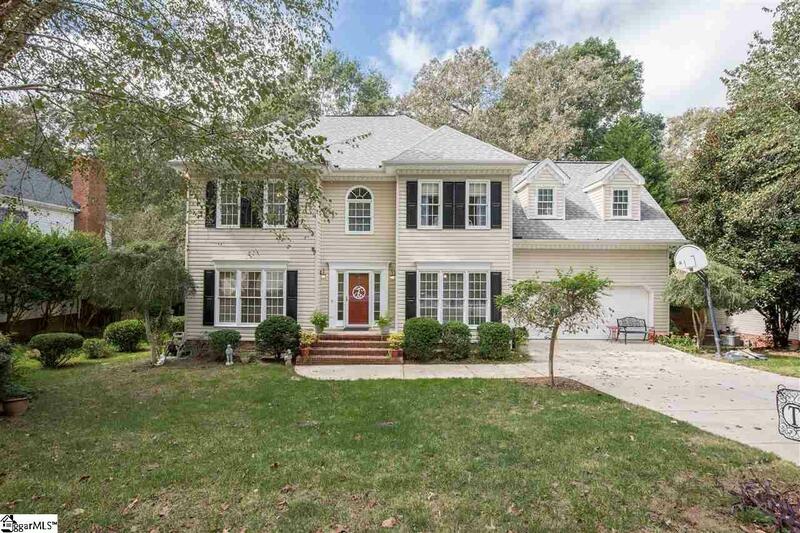 Very well kept 4br 2.5ba traditional home with hardwood floors throughout the main level. Front room could be a formal living room, library or office space with plenty of natural light coming in the triple windows and flows into the family room with a gas log FP with marble surround and white mantle. The formal dining room has chair rail and crown molding, chandelier and triple windows across the front wall. The kitchen has the WOW factor with great color, flow, and tons of storage and counter space. The center island with granite top offers additional counter and storage plus seating space. The breakfast eating area feels like a sunroom with windows all around, chandelier, and glass door to rear deck perfect for the grill and entertaining overlooking the fenced, shaded backyard. Upstairs features the good sized master bedroom with fan/light, trey ceiling and lots of natural light plus a full bath with dual sinks, tile floors, separate jetted tub and shower, and big walk in closet. Each of the other bedrooms also have fan/lights plus crown molding throughout the house. The upstairs shared bath has tile floors and dual sinks. Bedroom #4 could be a bonus room with a closet and has cool dormers that add lots of character. Upstairs laundry is not only convenient but useful too with a full wash sink, cabinets and shelving. This is a very well kept home in one of the most popular neighborhoods on the East side. Pelham Falls is known for its mile long paved walking path along the bordering Enoree River, summer time swim team and pool parties, and seasonal visits from Old Saint Nick himself. Residents enjoy 2 pools, tennis courts, soccer field, playground, basketball court, sand volleyball court, and clubhouse. Pride of ownership and pride of neighborhood can be seen everywhere around Pelham Falls. Like their community web site says, "we are not just neighbors, we are friends". Listing provided courtesy of Jamie Burns of Coldwell Banker Caine/Williams.